With an impressive indoor and outdoor facility, and teachers who know how to combine developing athletic skills with having fun, Ivy League’s physical education program is unmatched. 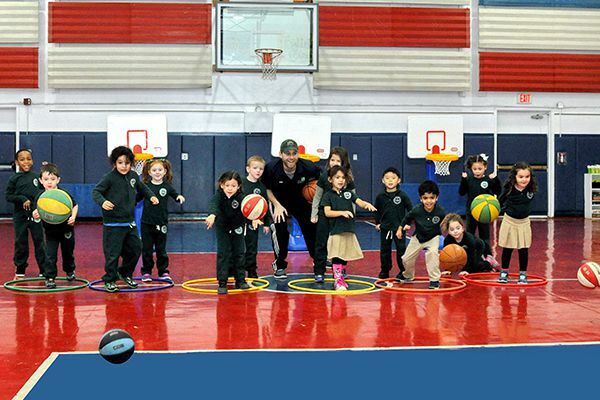 Our physical education program helps students develop physically, personally and socially. Beginning in pre-school, our youngest students experience the benefits of physical education and gymnastics. As students become more conscious of their bodies, small and large motor skills continue to develop. Additionally, listening skills and concepts like taking turns begin to lay a foundation for the years ahead. In our lower elementary school, students continue to build confidence and competence in gross and fine motor skills as a foundation for participating in physical games and sports. Students work with props like Frisbees, hula hoops and balance beams to develop spatial awareness, coordination, concentration and self-esteem. By scaffolding instruction, success builds on success and all students are motivated to do their best. As students progress through the grades, there is a greater focus on helping them reflect on their own performance and learning how to improve their skills. Strategies and tactics for play are taught in games such as soccer, basketball, gaga ball and other field and court sports. Instructional purposes include personal goal setting, fitness and teamwork. Weather permitting, many activities take place outside on our 16 acre campus. In the spring and fall, we open our outdoor heated pools where, under the watchful eyes of experienced lifeguards, students K-8 have an opportunity to enjoy a swim. Every year, our students participate in the Presidential Youth Fitness Program. Ivy League sports enthusiasts can also participate in our afterschool seasonal programs including karate, yoga, tennis, golf, rock climbing, basketball or soccer.